Leo Varadkar strolled through Dublin 7, flanked by his ministerial colleague, Paschal Donohoe, the pair carrying refreshments for the waiting media. That was on Friday 19 May, two days after Enda Kenny announced he was departing the Taoiseach's office. It may have started with coffee on the Dublin Street that bears his name, but Leo Varadkar's ascent to Fine Gael leader began a little further back. While a Trinity medical student, the young Varadkar, already had eyes on high office. "I always realised that doctors can only help a certain amount of patients, but the Minister for Health can really change things," Leo said in 1999. He didn't come from a political family; medicine was their forte. His mother, Miriam, was a nurse, originally from Waterford. His father, Ashok, was a doctor born near Mumbai in India. The couple met while working in England. They then moved to west Dublin where Ashok was a local GP. Interviewed in 1999 about why he got involved in politics, Leo Varadkar said: "We always felt that if you wanted to change things, then politics was the best way to do that." While campaigning for Simon Coveney in the 1998 by-election, he commented: "If I was ready in ten years' times I'd like to be in Leinster House." As it turned out, he didn't have to wait that long. Aged 20, he contested the 1999 local elections but lost out badly. Four years later, he was co-opted on to Fingal County Council and ran for election the following year, topping the poll. Three years later he won a Dáil seat for Dublin West and was catapulted onto the frontbench, initially becoming the party's spokesperson on Enterprise. He spoke about the issues he wanted to focus on. My priority for me is to concentrate on issues such as competitiveness, and also to make Fine Gael once again the party that people will turn to to set the economy right. He soon made his presence felt. His supporters said his style was refreshing; for others it was worrying. In 2010 in the Dáil chamber, he had this withering put-down for then taoiseach, Fianna Fáil's Brian Cowen. The former taoiseach and Fine Gael leader Garret FitzGerald was also caught in the crossfire. "You're no Seán Lemass, you're no Jack Lynch and you're no John Bruton. You're a Garret FitzGerald." You've tripled the national debt effectively destroying the country. So enjoy writing your boring columns in The Irish Times in a few years' time. Leo Varadkar backed the losing side in the heave against Enda Kenny, but he survived the Taoiseach's knife. Following the 2011 General Election, Fine Gael and Labour took office and he was given the Transport brief. He then moved to the Department of Health. On his appointment he said: "I'm not sure if I can turn a poisoned chalice into sweet wine, but I'm going to do all I can to improve our health services." He entered the department with some high expectations on him. His time in Hawkins House was relatively short and his legacy there is very much open to debate. He introduced free GP care for under sixes and over-70s. Universal Health Insurance, though, was parked. He continued to make waves, sometimes upsetting government colleagues. In 2012, during a controversy about the location of primary care centres in the constituency of then Health Minister James Reilly, Leo Varadkar said it "does look like" stroke politics. In 2014, he backed the garda whistleblowers. "There've been many words to use to describe their actions in recent months, but if I was to use one word, the word I'd use is 'distinguished'," he added. 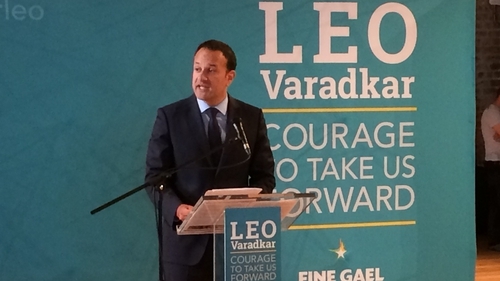 Leo Varadkar played a key role in the marriage equality referendum. Just months before, in a significant move, he spoke on RTÉ Radio about his personal life. "I am a gay man. It's not a secret but not something that everyone would necessarily know." More recently he was part of the negotiations to bring about the minority Government. He was then given the Social Protection brief. Recently, his campaign to cut down on social welfare fraud raised some eyebrows. Critics questioning the figures he quoted, said he was just playing to the Fine Gael base ahead of a leadership contest. His supporters wondered how a drive to reduce fraud could be regarded as something negative. Leo Varadkar's move to Social Protection was regarded as a sideways move, an attempt, perhaps, to hamper his ambitions. But the way he swamped Simon Coveney in the first few hours and days of the race proves he was focused and ready to move when Enda Kenny departed. His journey to the top of Irish politics has been a relatively short one. Eighteen years ago, fresh-faced, he spoke about what he expected from Fine Gael - the party he will now lead. "It's not just good enough to be the slickest and the brightest and the best-looking or the most popular or the ones who care about the people. We also have to put forward real ideas. We have to say to people in ten words what Fine Gael is." Leo Varadkar, the new Fine Gael leader, is now a Dáil vote away from being the country's youngest ever taoiseach.